We are into the 2nd week of January and I’ve started to move into high gear as plans and schedules for this month has more or less been finalized. The routine I’ve set myself this year is slightly different from last year’s as I am incorporating daily reading/devotion time in the morning together with lunch time exercise session with my personal trainer W(ii). I am starting the day slightly earlier as Monkey boy has to wake up earlier too as school has just started for the kids. This week I am doing HelloMornings mini-challenge, and studying the book of Colossians — a letter Paul wrote to the believers who gathered in the city of Colossae. I find that it is a great way to start the day off with devotion time. After devotion is time for preparing breakfast for everyone and ensure that everyone gets ready to leave the house for school/work. On the way to sending R to work we will be listening in to pre-downloaded Cantonese radio programs on a variety of topics -parenting, health, food etc. After he reaches the office I will put on the CD player and the kids and I will listen to our favourite KPop tunes. We recently purchase the latest CNBlue CD and the Best of 2pm while on vacations in Japan and love listening to the songs. Once Tiger girl has been dropped off at school Doggie boy and me will either head straight back home or grocery shopping if it is grocery shopping day. This is my daily 1-1 time with him. With this time I will be coaching him in his academic studies, piano practice and holistic development. If he does have homework from school I will ensure that he get’s it all completed before leaving for school in the late morning after lunch. If there is time left over after completing all the tasks Doggie boy gets 20-30 mins on the playstation to play Minecraft. While Doggie boy is engaged in his studies/activities I would be multi-tasking and cooking lunch for him and doing the housework. Once lunch is prepared both of us will be settling down at the dining table to have our lunch together. He get’s to watch his show on TV while I watch my Korean Drama online on the iPad. Once Doggie boy has left for school it would be time for my lunchtime exercise session with my personal trainer W(ii). I’m currently alternating between the 30 day challenge on Wii and Wii fitness plus for a variety of activities during the 30-45 min training session. I’m exercising three times a week during lunch time where I get my me-time and am free from the kids distracting me. In the hours after Monkey boy returns from school it will be my 1-1 time with him where I coach him in his studies, oversee his homework and complete any blogging posts or online work that need to be done. When late afternoon comes around it would be time to fetch Tiger girl from school and get dinner prepared before R return’s from work and Doggie boy from school. After dinner while the boys do their piano practice/ homework it will be my 1-1 time with Tiger girl where we read story books, flash cards or play dollhouse or whatever game she fancies for the day. Before bedtime I will do reading with Doggie boy. This year I intend to read more books with him and we alternate between reading English and Mandarin books each night. As English story books can be rather lengthy we do a chapter each night and both he and me read alternative pages of the book. Monkey boy will do reading with R so we can make sure that the boys get to bed on time. How does your daily routine look like? It was a great week for the kids last week as we brought them to Disneyland. It was a dream come true as the kids have been asking to visit Disneyland again since we brought them to Hong Kong Disneyland a few years back. This year we decided to bring them to the Disneyland in Japan so that they could have a different Disney experience now that they are slightly older. Here is a list of 10 items of the things that we did during our vacations. 1. The kids got to experience their first winter with temperatures dipping to about -5 degrees at night. The scarfs that they made really came in handy. 2. The kids and I got to eat our fill of sushi. There were so much variety and some of the sushi we ordered were not readily available here in Singapore. 3. 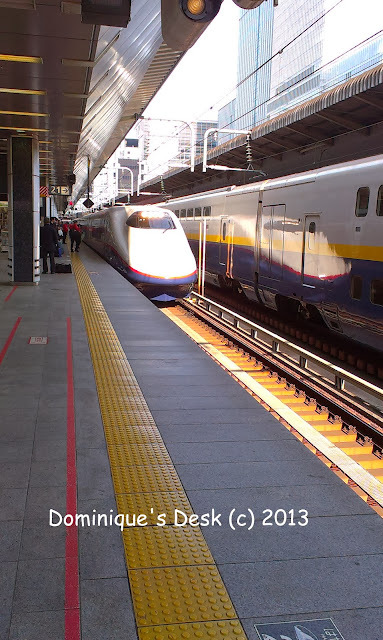 The kids got to ride on the Shinkansen(Bullet train) twice as we traveled from Tokyo to Kawazawa and back during our holidays. 4. The kids visited a train museum and got to ride on some of the rides there. They got to see how it was inside the engine room of a steam train. 5. What is a winter vacation without a trip to the snow fields? The boys got their first experience of snow and skiing when we brought the to the ski fields in Kawazawa. 6. We got to see snow capped mountains and lovely scenery. 7. We enjoyed eating Shabu Shabu and Yakiniku during the week. Now is back to my detox dieting. 8. We went waterfall viewing and took many lovely photos there which I will be sharing on the blog later. 9. We got to go on many different rides in Disneyland and Disneysea. I preferred Disneysea better as it was more family friendly and less crowded. 10. We saw one of the most beautiful sunset while at Disneysea. Don’t you find it lovely?